Seven years have passed since Dale's sister Cathy disappeared with her clothing and a crystal left behind. Dale will never see her sister again and starts to throw the crystal into the river when a storm passes overhead and transports Dale into another world. Raf Jel Jater searches the mountains for the slaver Devros when he comes across a naked unconscious Dale and saves her life. When she awakens, she realizes that she is no longer on earth but on a world much like medieval Europe. Raf pretends to be a slaver so he can locate Devros and put an end to his crimes that threaten to plunge the country into war. Dale is frantic to find the crystal that Raf hides from her because she has to go home to her daughter Thea who needs her for a kidney transplant. Thea uses the remaining crystal to transport herself to the world her mother is in and finds some allies that guide her in this strange land. As Thea struggles to reach her mother, Dale realizes she loves Raf but knows she and Thea must return for the life-saving operation. Elysa Hendricks is a first class fantasist who builds incredible worlds and creates alien species that seem believable. Readers will adore the Shakar, a feline humanoid species who lack mankind's ruthlessness. They adopt Thea in a special magical bonding ceremony. Raf and Dale are warriors, willing to fight for a cause. Fans will root for them to find a way to be together if he survives his battle with Devros. 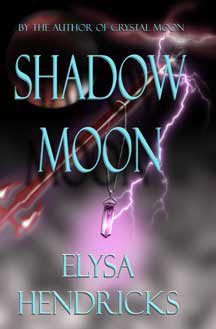 SHADOW MOON is an enchanting romantic fantasy that readers will put on their keeper shelf.